Today we look at a handful of street histories that prove curious and interesting and several transportation innovations. Belleville Avenue was originally known as North Broad Street. Belmont Avenue was changed to Irvine Turner Boulevard, according to a Newark News article, at the vehement urging of Central Ward Councilman Dennis Westbrooks. Branford Place, between Broad Street and Springfield Avenue, was created by moving one of Newark's oldest cemeteries—an event of great concern at Old First Church. The change also drew the wrath of historical societies and criticism from the commercial community for its total lack of sensitivity. Consequently, the long-abandoned settlers' graves were transferred to Fairmount Cemetery. The name Branford related to the English town where the town's first minister, Dr. Pierson, was born. Bridge Street today joins Essex and Hudson counties at Riverfront Stadium. It was once a crossing point for stagecoach service and the site of several bridges over the Passaic. In 1872 it was made free from tolls. Central Avenue was originally a short street. 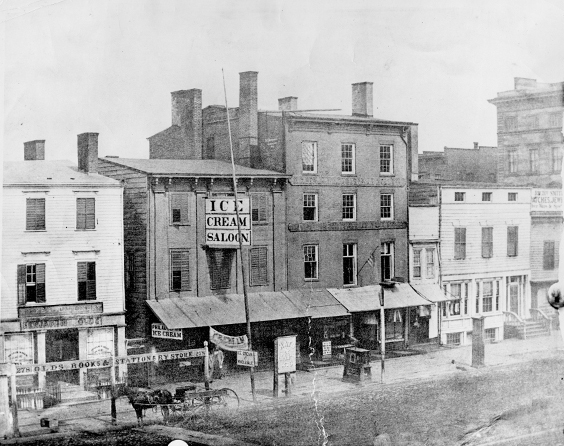 In 1867, it was cut through to Broad Street from Washington. Later it was extended west with the help of an appropriation of the state Legislature. Clinton Avenue at one time was known as Elizabethtown Avenue. Early on, it was an old toll road complete with toll gates. Later it became a macadam road and the site of the first Irvington horse-car line. The route did not prove profitable and was later switched to Springfield Avenue. Llewellyn S. Haskell, who developed West Orange's exclusive Llewellyn Park, a gated community, pushed for the establishment of the Essex County Road Board in 1868 and 1869. It resulted in 1870 in the takeover of Bloomfield, South Orange, Springfield, Frelinghuysen and Central Avenues. While this might have been done to help in the development of Llewellyn Park, it also helped many others who were able to use these roads. Darcy Street in the Ironbound was named for Dr. John Stevens Darcy, whom we have already met in the California Gold Rush. He was a physician, railroad founder, soldier and adventurer. Early in his medical career he became well-known and liked because of his skill in treating Newark's cholera epidemic, and for his generous support of numerous charitable projects around town. He also became president of the New Jersey Railroad and Transportation Company. Dark Lane was originally High Street, and East Park Street was first called Smith Street. Gouverneur Street was named for Isaac Gouverneur, whose estate was on the bank of the Passaic River spread across 18 acres. Located at 123 Belleville Ave. and called Cockloft Hall, it served as a summer residence for Washington Irving, who wrote his famous 'Salmagundi Tales' in the house. The estate's owner made his fortune in Curacao and helped in the rebuilding in 1792 of the old Newark Academy following its destruction during a British raid. Halsey Street was opened in 1806. Originally, it ran only from the Upper Commons, Washington Park to Academy Street. By 1872 it was opened up to its full length and became one of Newark's busiest streets, home to Goerke's, Kresge's, Hahne's and Bambergers. Heller Parkway was originally named Fredonia Avenue. On March 7, 1901, it was renamed for Elias G. Heller, a successful Newark manufacturer of files and rasps. His home was on Elwood Avenue and he was involved in land development and The Forest Hill Association. He donated 18 acres to what became Branch Brook Park. Martin Luther King Boulevard, formerly High Street, came about because of the activism of Allen King, a Rutgers student. Initially, there was an attempt to rename Elizabeth Avenue, which met with great resistance by local merchants and was especially opposed by the Rev. Waymon Carter of the Elizabeth Avenue-Weequahic United Presbyterian Church. Mt. Pleasant Avenue was mentioned in the Newark Daily Advertiser of July 25, 1862, in this fashion: 'Mt. Pleasant Avenue has been opened to Oriental Street near the Foster Home and is now a spacious broad avenue which has become a favorite thoroughfare for those who wish to escape the pavement of the main street. Several streets have been laid out to intersect it, and it also affords delightful drives. Many fine residences have been erected on Broad Street, access to which is facilitated by the Horse Car Railroad which extends to the cemetery. This is adding to the development of dwelling places of our successful citizens, and suburban quality of life in the area in the near future as new houses are built in this section of the city.' A portion of the Old Road to Bloomfield survives today between Elwood Avenue and Heller Parkway. Sydenham House, the city's oldest residence, simply uses 'The Old Road to Bloomfield' as its address. During the lifetimes of D.J. and Elizabeth Henderson, who owned it for many years, it was the only house in Newark that had no street number. Fewer and fewer people remember the name Plane Street but it was for generations a major street name in the downtown district. On Jan., 1, 1967, Malcolm Talbott, provost of Rutgers-Newark, pushed through the new name—University Avenue. This represented the dawning of a new era in the great new tradition of higher education. Newark's industrial past was becoming a thing of the past. It was at the Morris Canal and Plane Street that Henry Clay, while visiting Newark, saw canal boats lifted on the steep inclined plane—today's Raymond Boulevard, between what is now the parking deck of Essex Community College and Lock Street at the top of the hill. Others held that Plane Street was named because of a Plane family that lived in the vicinity. Another theory is that residents referred to a swath of large sycamores as plane trees. Still another: because of a nearby factory which manufactured carpenters' planes. References have been found to Walnut Street at Grace Church and Broad Street as early as 1797 when that site was occupied by the original Essex County Courthouse, and to West Park Street originally as Park Church Plaza because of the Park Presbyterian Church, which was demolished years ago. And so the name changes go on, reflecting internal as well as external evolution. The first asphalt roadway in the United States was laid opposite Newark City Hall in 1870 by Belgian Professor E.J. Demedt. It was an experiment of European road asphalt or Trinidad Lake pitch. Two years later another experiment was undertaken at Union Square, New York City, of Val de Traves Rock asphalt. What seems so ordinary now was highly experimental at the time. In 1938, the Newark Sunday Call reported on Aug, 11 that 3.5 miles of Raymond Boulevard, Newark's longest street, had been paved, drawing 'visitors (who) came from all parts of the East to inspect it.' Representatives from Washington, D.C., liked the results so much that they ordered asphalt for many of the district's streets. The extraordinary had become common place as paved streets got their start outside the front door of Newark City Hall. Another Newark curbside innovation was the evolution of a simple but practical street sign that everyone came to accept as part of everyday existence. The new signs were made of reinforced concrete with blue and white metal enamel plaques. They remained popular for more than a half century, predating the current green signs of today and the handsome newer signs in some areas of the city that indicate cross street, street number, location and special district within the city. Before 1910 it was the custom to attach street signs to a nearby building. This was a good solution as long as there was a building at that location. To give the city a uniform sign, it was decided to experiment with a free- standing sign, reinforced with metal. It was believed that reinforced concrete would withstand bad weather and young boys' pranks. Economy was also a consideration, for the signs could be turned out at very small cost. According to the city engineer, it was not an easy task to remove the sign without the proper tools. In 1911, the Sunday Call reported that the Board of Public Works' installation of the new devices brought 'favorable comments of thousands,' and that 'they are legible for long distances (and) are on neat-looking metal poles.' The markers were so successful they remained in place for more than 60 years. Next week we will conclude our series on streets and roads by traveling along some of the major 20th century roadways.